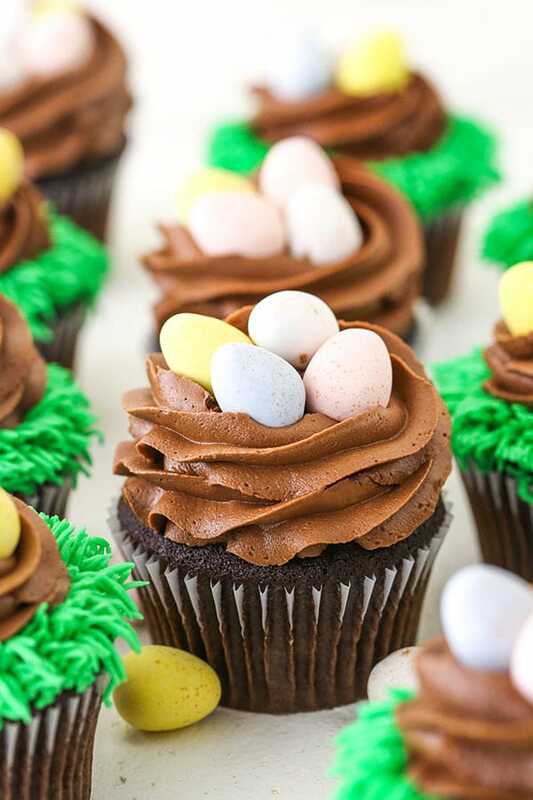 These Easter Egg Chocolate Cupcakes are moist chocolate cupcakes topped with chocolate frosting “nests” and pastel colored Easter eggs! 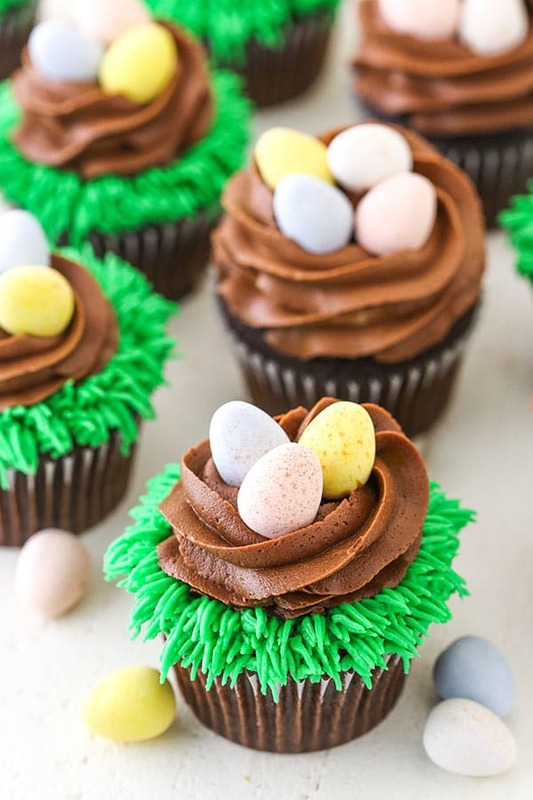 They’re cute Easter cupcakes that are also easy to decorate! They’ve been walking for a little more than a month now and they are strong walkers (even kind of running a bit), so we will definitely hide eggs and then help them find them. They may lose interest in like 5 minutes, but hopefully we can make it fun. The one thing I really don’t know what to do with is the Easter baskets. Should I just not do them yet? That doesn’t seem fun at all. But if I make baskets, what do I put in them at this age? They certainly don’t eat candy yet. I could give them some blueberries and raspberries – they love those. Ha! Perhaps I should bestow them with some cute bunny ears that they have to wear for a picture and then show them how cute they were one day? A little torture is good for a kid, you know? Sadly, they aren’t really old enough to enjoy one of these cupcakes. Although I wouldn’t be opposed to letting them try a bite, they just haven’t shown much interest in baked goods. Clearly I’ll need to fix that one day. Anyhow, these cupcakes are awesome for those old enough to enjoy them. They are moist, soft and oh-so-yummy! I often go with my trusty Moist Chocolate Cupcakes for something like this, but this time I decided to shake things up. These are a chocolate cupcake version of my Moist Vanilla Cake. I’m pretty in love with these chocolate cupcakes. As opposed to my classic one, these use both butter and oil, rather than just oil. You get the nice flavor of butter, with the moisture of oil. I’m definitely a fan. 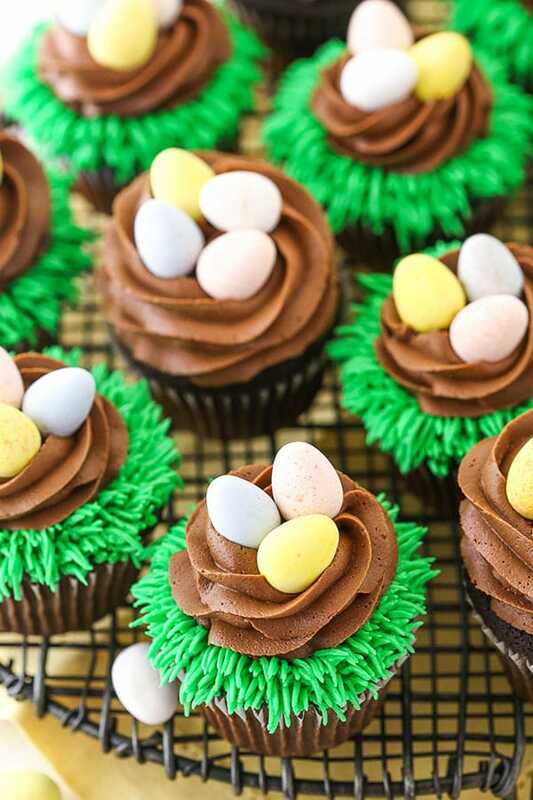 As for how to decorate these easter nest cupcakes, they really are quite easy. I wanted to use primarily chocolate buttercream, but have a little bit of vanilla to use for the green grass. You could totally go without the grass (which is even easier to decorate), but the grass is kind of fun. So to make the frosting, combine the butter and shortening, then add the powdered sugar, a pinch of salt, the vanilla extract and some water or milk to thin it out a bit. Next, set aside about half a cup of the frosting, which you’ll use for the green grass (just add a little green gel icing color). Add the cocoa powder to the remainder of the frosting. You can add a little more water or milk to thin it out a little more, but then you’re ready to decorate! To make the grass, you’ll use the grass icing tip. It makes it really easy. Pipe the frosting around the outer edge of the cupcake. I piped about 2 rows. Fill in the center of the cupcake with a swirl of chocolate frosting. You want to pipe two swirls/circles – one directly on top of the other, sort of stacked – with a opening in the middle. In the opening, you’ll add the eggs. If you’re just making the nest and leaving off the grass, you’ll use the same motion of piping with the chocolate frosting, but it’ll be a larger circle/swirl. I actually piped a little dallop right the in the middle of the cupcake and then added the swirl. The dallop kind of keeps things in place, so the frosting doesn’t collapse into the center. You can see a picture of what I mean about the dallop in my tutorial for how to frost cupcakes. The first method I show uses the dallop. Just fill in the nest with your favorite Easter egg candy and you’re all done! I used mini Cadbury eggs, but Whoppers Robins Eggs are awesome too. And I’m not gonna lie, jelly beans are a weakness. They’d be great on top as well. 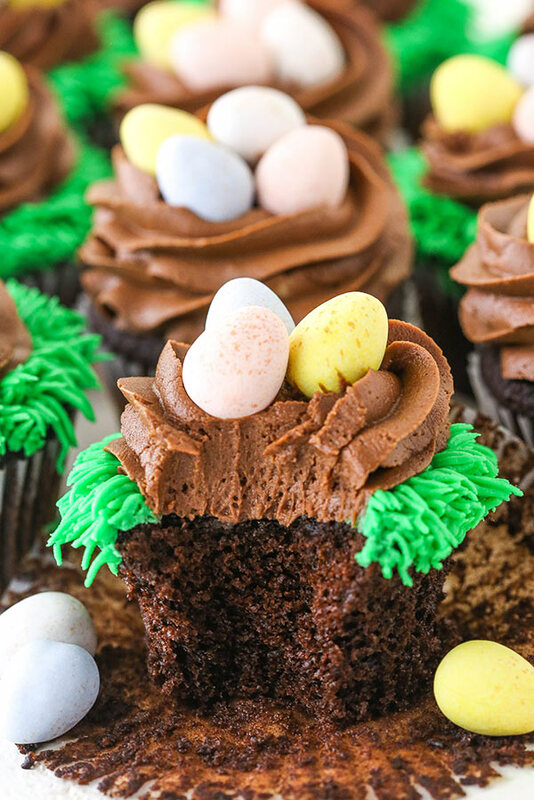 Whichever candy you use, these Easter Egg Chocolate Cupcakes are sure to be a hit! 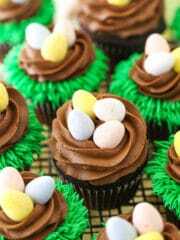 These Easter Egg Chocolate Cupcakes are moist chocolate cupcakes topped with chocolate frosting “nests” and pastel colored Easter eggs! 1. Preheat the oven to 350°F (176°C) and prepare a cupcake pan with cupcake liners. 2. To make the cupcakes, combine the flour, cocoa, baking soda and salt in a medium sized bowl and set aside. 3. Add the butter, oil, sugar and vanilla extract to a large mixer bowl and beat together until light in color and fluffy, about 2 minutes. Do not skimp on the creaming time. 6. Slowly add the milk and mix until well combined. 8. Fill the cupcake liners about three quarters full. Bake for 15-17 minutes, or until a toothpick inserted comes out with a few crumbs. 9. To make the frosting, beat the butter and shortening until well combined. 10. Add about half of the powdered sugar and beat until smooth. 11. Add the salt, vanilla extract and about 2 1/2 tablespoons of water or milk and mix until well combined and smooth. 12. Add the remaining powdered sugar and beat until smooth. 13. Remove about a 1/2 cup of frosting and set aside. 14. Add the cocoa powder to the remainder of the frosting and beat until well combined and smooth. 15. 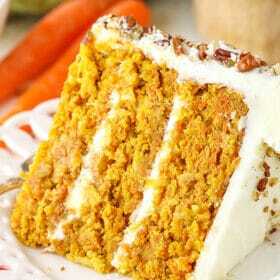 Add additional water or milk, as needed, to get a good consistency frosting. 16. Add the green gel icing color to the vanilla frosting that was set aside. 17. 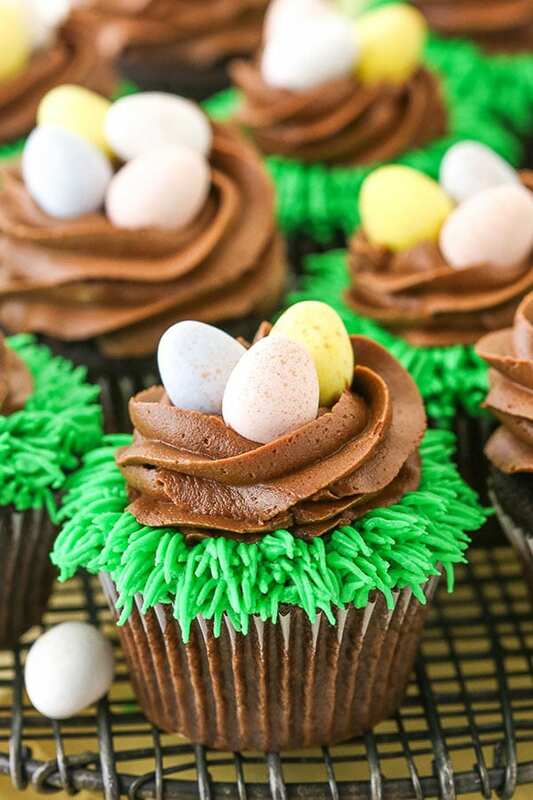 To decorate the cupcakes with the grass and nest, use Wilton tip 233 to add two rows of grass around the outer edge of the cupcake. Fill in the center of the cupcake with the chocolate nest. To make the chocolate nest, use a large closed star tip. I used Ateco tip 844, but Wilton tip 1M or 2D would work as well. Pipe a small swirl/circle of chocolate buttercream and do two rotations, making one right on top of the other and leaving the center open. Add candy eggs to the center of the nest. 18. To decorate the cupcakes with just the nest, use a large closed star tip, such as the ones mentioned in the step above. Pipe a small dallop of frosting right in the center of the cupcake. This is fill in the center of the swirl you will pipe in a minute and keep it from sinking. Start at the outer edge of the cupcake and pipe a swirl/circle around the outer edge. You’ll want to do two rotations/swirls right on top of each other, leaving the center open. Add the candy eggs to the center of the swirl. Such wonderful cupcakes, Lindsay! 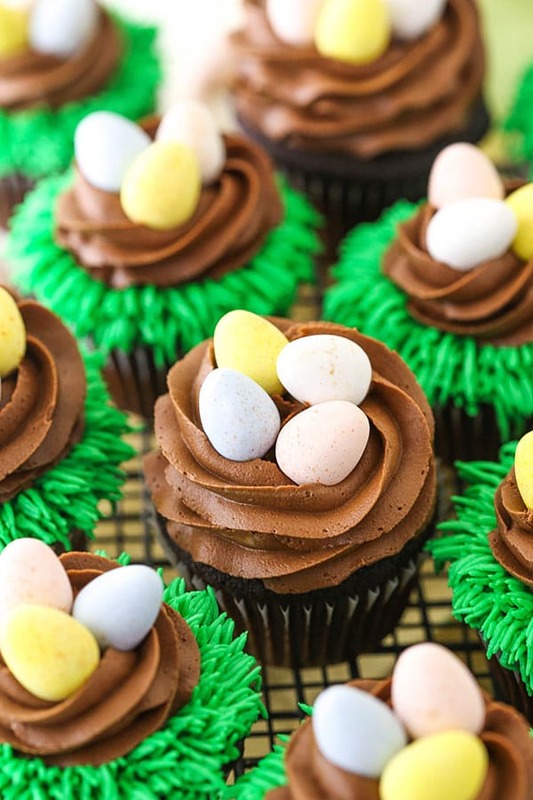 The chocolate icing looks very delicious and Cadbury mini eggs are my favourite Easter treat. Thank you so much for sharing!! My twin boys are just about 7 months now and I’m just barely getting into the kitchen to do some baking😊 I love reading your posts and I can’t wait to try this recipe! These look amazing! 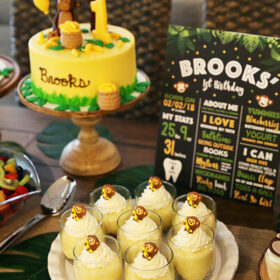 I love baking family little treats, never thought of the grass idea so will be giving it a go! Could you tell me please what is shortening (I’m in the UK)? It’s a butter replacement (crisco). If you don’t have it there or aren’t a fan, you can replace it with additional butter. Yes, just replace some of the milk or water. So glad you’ve enjoyed everything! Thanks Ruth!